BALDWYN (AP) - James "Babe" McCarthy, who coached Mississippi State to its greatest basketball heights and later was a successful coaching the professional ranks, has died after a year-long bout with cancer. He was 51. Death came Tuesday at a Baldwyn hospital only a few hours after McCarthy was inducted into the Mississippi Sports Hall of Fame in Jackson in ceremonies he was unable to attend. Tributes poured in immediately from former friends and on-court foes. "Babe was a great competitor," said Adolph Rupp, the former University of Kentucky coach whose teams waged intense Southeastern Conference battles with McCarthy's squads in the late 1950s and early 1960s when Mississippi State won four SEC titles. "He was a great person," said Kermit Davis, the present Mississippi State coach who was the first player recruited by McCarthy at State. "Babe was loved by the players, the ownership and administration of the league," said Mike Storen, who was general manager of the American Basketball Association's Kentucky Colonels when McCarthy coached there in 1973-74 - his last coaching post. A native of Mississippi, McCarthy attended Mississippi State and coached there from 1955 to 1965, three times winning SEC Coach of the Year honors. He produced a series of outstanding players, the most widely noted being Bailey Howell, who later starred with the Boston Celtics. McCarthy's teams twice had over-all records of 24-1, and his career record at State was 168-64. 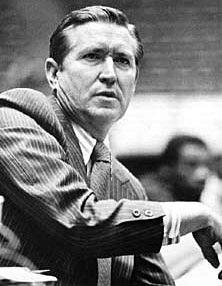 He later coached ABA teams in New Orleans, Dallas, Memphis and Louisville, and twice won honors as the league's coach of the year. He was dismissed by the Colonels, however, after they were blasted in four consecutive games by the New York Nets in the ABA's Eastern Division playoffs in the spring of 1974. McCarthy returned to Mississippi and underwent surgery for cancer of the colon on June 19, 1974. He spent most of his remaining time at his home in Baldwyn, unable even to travel less than 100 miles to Starkville two weeks ago when his alma mater honored him a the halftime of the Kentucky-Mississippi State game. Rupp, a participant in those ceremonies, said Tuesday, "I had some trouble getting transportation ... but now I'm so glad I went down there. I talked for three or four minutes (via television) directly to Babe, and I hope he got to see it." The family said funeral services for McCarthy will be held at 2:30 p.m. Thursday at the Waters Funeral Home in Baldwyn, with burial at the Masonic Cemetery. McCarthy's survivors include a sister and brother and two sons. He had been divorced for several years from his wife, Laverne. McCarthy was noted as an optimist and for his sense of humor. When someone left a black wreath on his team's dressing room at Starkville after a Mississippi State loss to Kentucky, McCarthy ordered that the wreath be saved. A year later, after State defeated Kentucky at Lexington, McCarthy placed the wreath atop one of the goals in the Wildcat fieldhouse. It was said that McCarthy had nothing to do with the placing of a stuffed skunk under the Kentucky bench during one game at Starkville, but the incident is remembered as symbolic of the high feeling between the two teams. "His death is a tremendous loss to basketball," said Davis, who McCarthy signed to a Mississippi State scholarship in the tiny dressing room of the Baldwyn High School gym several weeks before the official announcement that McCarthy would become State coach. "He had a lot to do with basketball being what it is today, Davis said."